"Customer feedback inspired this redesign effort. 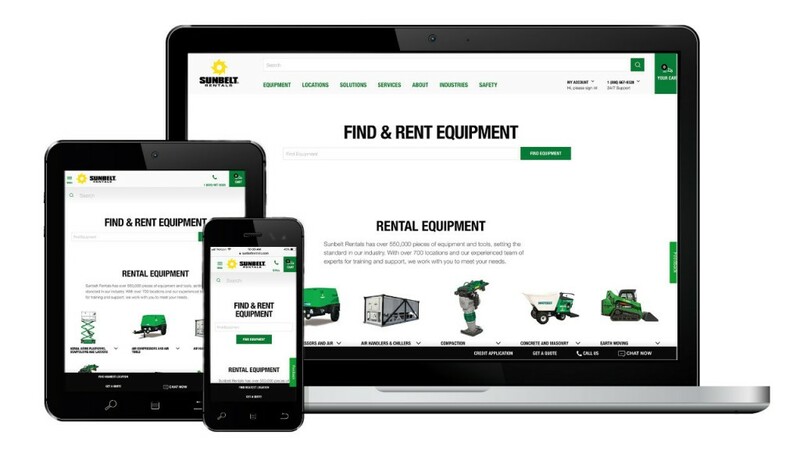 Ultimately, our digital strategy is aimed at making renting equipment as easy as possible; our new website functionality has absolutely enhanced our customer experience," said John Washburn, Senior Vice President of Sales and Marketing at Sunbelt Rentals, Inc.
• U.S. and Canadian businesses have been merged into one website. • New equipment detail pages feature updated images, descriptions, and specifications. • "Find and Rent Equipment" directly from the home page. • "Solutions" section features content focused on highlighting application expertise. • "Industries" section provides overviews demonstrating the broad offering of industry-specific solutions. • Accessibility allows users to request a quote, find nearest location, call for more information, or click a "Chat Now" button. • Improved availability information means customers will be directed to the closest available machine, and its rate, based on their location by ZIP code. • Mobile optimization ensures those on the go can quickly and easily find and rent the equipment they need — right from their smartphone or tablet. Explore the new features and user experience at Sunbeltrentals.com.